We do it the old fashion way, when the conditions are dangerous and there are lightening strikes, we are on watch. 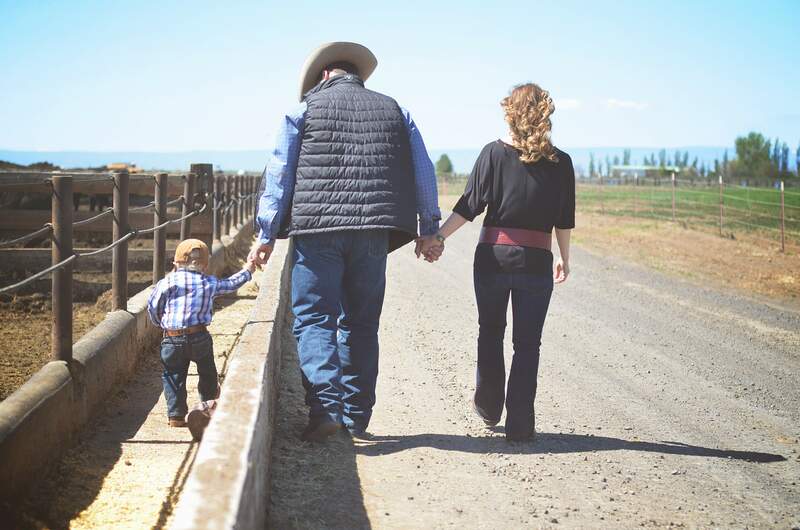 The Gebbers family in Brewster, WA has been raising cattle for more than four generations. They actively use management tools to improve their land. They also work with state and federal agencies in continually examining how to better their grazing resources and water quality. "We’ve proven it on our own place, this place survived the two big years of fires in the county for a reason, it was in good health." How do You avoid Forest Fires? We monitor the lightning strikes. There is actually a lookout here and Department of Natural Resources allows us to man it in the summer. We do it the old fashion way, when the conditions are dangerous and there are lightening strikes, we are on watch. We report the fires and get on them right away. What is your best tool for fire control? Cass Gebbers: If you rotate your grazing on these forest pastures correctly you’ve kind of created a natural buffer where the fire wants to burn lower on the ground because you’ve taken a lot of the fuel out, that two or three feet of dry grass has been eaten. If you graze these pastures on a rotation in the spring before the grass gets dry you take the fuel down to the carpet of the forests. The fires will happen but they'll creep around down low but won't climb up. The health of a forest will allow the fires to burn through the floor and not get up in the canopy and wreak havoc. You get these horrible canopy fires from unhealthy forests that are congested or have lots of dead trees from bugs. These unhealthy forests are all canopied-in and tight and there is no way to control them. Nothing you can do. You might as well as get them thinned out and graze a little bit so a fire doesn't have the fuel to get out of control. What happens if a fire starts? We try to be proactive. Fires happen, that's just reality. In the middle of July it’s always low humidity and the wind is howling, so you can't just leave a forest fire burning. So we try to attack them aggressively. Then we try to work through the rehab where it does burn. We reseed with native grass seed and do some thinning of the trees, under growth and branches. We try to keep the bugs out so they aren’t attacking the fire-damaged trees. And, of course our pasture management plan comes into play to help the open pasture and forest pastures rebuild and maintain health. We have to make our living from this land. We can’t abuse it. If we abuse it, that sixth generation won't be raising cattle here. What do you do here at Gebbers Cattle? Cass Gebbers: I’m a cattle rancher, but we also raise apples, pears and cherries and have a little timber land. You have a rich family history here in Washington, can you tell us about how you got started? My great-grandparents settled here about 120 years ago, just before the turn of the century. There was a small saw mill here. They ran cattle to help feed people. At first they had Shorthorn cattle then raised Herefords in the late 1920s until the 1970s. Then the family transitioned over to Angus cattle. This is a lot of cattle and land here, it might look like a pretty big business to some. Would you consider yourself a family farm? Yes, this is a family farm. We have five generations of Gebbers invested in running and operating this family business. We've got 20 nieces and nephews, of those, 14 of them are directly involved in either the cattle or orchard. The youngest of the fifth generation is a 9th grader who works with us. And the next generation is coming up, the sixth generation of our family is already growing. We have a very tight knit family with a strong succession plan built in so Gebbers Cattle and Gebbers Farms can be sustainable. What do you feed your cattle? Our cattle spend most of their lives within 30 miles from home, enjoying mountain pastures and native range lands during the spring, summer, and late fall months. Coordinated pasture rotations allow for extra grass to ensure grazing into the early winter when the cattle are trailed closer to home for winter feeding. We raise most of our own feed, including corn silage and alfalfa hay. We also bale neighboring wheat straw and feed apple pomace during the winter months. Do Gebbers Cattle and Gebbers Farms support each other? We have a composting operation for our manure. So we gather all of our manure out of our backgrounding feedlot and we mix it with pre-commercial thinnings off our forests, the beaten up apple bins and wood pallets get ground up too, and we put some lime in that we use to control the atmosphere for our stored fruit. All of this manure and wood and lime goes into the compost where we roll it around and let it break down. When it's done being "cooked" we spread it out to the fields or on to the orchards. Nothing here is wasted and every part of the business supports another - tree trimmings, manure, rotted apples and leaves, everything is going into our compost and then back out into the soil. Tell us about raising cattle in this part of Washington. We are in a very dry part of the state. We only get about 11 to 18 inches of precipitation a year. So, we’ve been on a coordinated resource plan since the 1980's that is put together with the help of various agencies, like the Game Department, DNR and Forest Service, to create an optimal grazing plan for our cattle. We have 500 miles of fence and over 100 pastures we rotate out of and through during a year. We try to not graze one pasture at the same time each year, in consecutive years. So, it is a rest-rotation plan that optimizes grass growth and pasture recovery. Because it's so dry, we’ve run about 40 miles of pipeline and multiple water tanks up out of the bottom of our land, so the cattle aren’t camped down in the damp areas, but have water access up on the hills, so they want to be up on the ridges where they are healthy and they are happy. Smart grass management and moving water has allowed us to properly support more cattle in our herd and grow our business. In the winter when snow prevents use of pastures we have several options. We have a winter ranch on the Columbia River in the Rattlesnakes. And we have a ranch in northern Douglas County. When the cattle are at the winter ranches they're eating the corn silage, hay, straw, alfalfa, apple waste and other local feed stuffs. What is your vision for this family business? I want to work with my kids and have them come home and want to do this too. My goal is to also be economically sustainable so we can be environmentally responsible. Finally, I want to develop a cow herd that exceeds industry average data so that our product is desirable; we want to pull demand, not push supply. Meet the people who raise beef in Washington. These local family farmers and ranchers work hard to feed their families, and yours! Will and Nicole sat down for a question and answer session and here is what we learned!